First of all, endless props to the American government on making the right decision for marriage equality. Love wins, huzzah! Nothing made the Beard and I happier than waking up to a fresh face of rainbows for every single person on our newsfeeds. 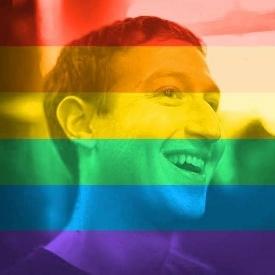 The jaunty manner of everyone’s gayness simply sent waves of happiness into my body, and I immediately decided I needed to be made into a rainbow just like Zuckerberg here. Shortly after making my decision to get technicoloured, I headed straight to Photoshop to see it done. However, the Beard kindly pointed out that instead of going through the relatively lengthy process of doing my own ROYGBIV overlays, Facebook themselves had provided a ‘click-of-a-button’ solution for turning my face into the skittles box I desired. Not only was I pleasantly surprised by the fact that Facebook had taken on such initiative towards the widespread knowledge of an important social justice issue, I was impressed that the boundless reach of social media that day was used for nothing but good. Thankyou devil’s advocate for posing this question! The Beard and I are of the opinion that while rainbow day was certainly a great way of showing an entire population’s partiality to new social developments, the trend would not go nearly as far as it did without the aid of Facebook as an enterprise. Facebook’s ability to almost singlehandedly give millions of people the opportunity to champion a cause in the most obvious of ways truly highlights their image not only as a vessel for communication, but a multinational business with its own set of values and ambitions that has now spread throughout the world in an instant. Of the hundreds of worthy social justice campaigns that exist in the world today, equality in love and marriage was the first to gain such heavy participation and notice, simply because Facebook made it so. From a business or professional context perspective, Facebook has proven their ability to connect with their users in a way unparalleled by other organisations of a kind. Businesses can now take away the lesson that engaging with an audience is as simple as finding something extrinsic which actually motivates them to be engaged in the first place. Seven colours, one filter and 26 million voices saying yes to marriage equality. Now THAT’S a damn simple way to procure a decent following; way to set the bar Facebook.